Widest range of New & Preloved Equipment. 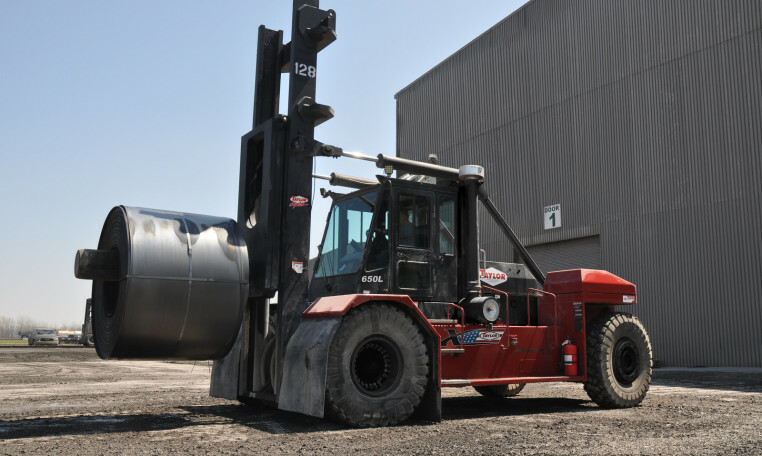 Taylor has been designing and manufacturing Container Handlers since 1966. We are currently manufacturing our 7th generation of innovative, industry leading container handling equipment. 50 years of loaded and empty container handling experience. We offer several applications and industry-specific modifications & attachments for the Stevedoring, Intermodal and Port operations industries. Features include: Taylor Made Spreader, Wide stance drive axle, End User Diagnostics, Joystick Controls, Heavy Duty Lift Chains, Enclosed All-Steel Operator Cab, Super Heavy Duty Hydraulic and Engine Cooling System, Heaviest built steer axle in the industry and standard LED lights. ENGINE: Cummins QS9L-C250 HP engine Tier 4F, Tier 4 Final electronic turbocharged, charge air after cooled (air to air) diesel, 6-cylinder diesel engine has 543 cu-in. (8.9 L) displacement. (TICS) Taylor Integrated Control System: A sophisticated & end-user diagnostics system with 7in touch-screen display mounted into the instrument panel. Transmission: The three-speed, fully reversing, fully electric, modulated powershift transmission has inching, electric joystick with push button control, and a separate air-to-oil cooler. The filler pipe dipstick and large, heavy-duty oil filter are easily accessible. Filter is mounted to transmission. Automatic powershift (standard). Drive Axle: The heavy-duty planetary type drive axle housing is bolted to the frame. Steer Axle: The single hydraulic cylinder design steer axle, with heavy-duty links from the cylinder ram directly to tapered roller bearing mounted spindles, has tapered wheel and kingpin bearings. All joints are sealed, can be lubricated, and never need adjusting. Hydraulic System: The high-capacity hydraulic tank has a spin-on tank breather, wire-mesh strainers, and full-flow 10-micron return-line filters, with a replaceable element in the tank. Tank refill capacity is 114 gallons (432 L). Browse through the vast selection of equipment that have recently been added to our inventory. © 2019 Fowlers Machinery 2017 Ltd.